Recently 2K invited us to New York City to preview Civ V, gave us a brief presentation on the game and then ushered us into a small room stuffed with computers, suffocating in the summer heat. Everyone seemed surprised - except the New Yorkers. New Yorkers live their lives getting used to their city's quirks, and they love it for the quirks. They know that no matter how much high-tech infrastructure you heap on top of the old pile of concrete and steel, the town will never be completely livable. It refuses to shed heat in the same way it refuses to stay quiet. New York City is a city of many wonders, but it will never let you forget that, underneath the glittering neon lights, the LED streetlamps, the full-motion billboards and the fiber-optic broadband internet, it is a city built to accomplish many various and wonderful things, none of which is to make you comfortable. If you put 12 computers in a room with windows, in New York, in June, then it's gonna get hot. New Yorkers know this. They accept it. If you don't like it, then you can go back to Jersey (or wherever). Especially if you've been invited to an exclusive hands-on preview of one of the most eagerly-anticipated videogames of the year. A game that's been five years in the making. A game that will surely cause multiple sudden illnesses the world over upon its release, as salivating fans cash in sick days in order to spend as much time as humanly possible playing it. So when you're invited to New York City, in the summer, to sit in a sweltering room and play this game - before anyone else in the world - you don't complain about the heat. You complain about being given only 45 minutes. Forty-five minutes is a blink of an eye in Civilization Time. It's barely enough time to escape the Stone Age. What can you do in 45 minutes? What can you say about it? Turns out, quite a lot. To start with, allow me to lay to rest any concerns that Civ V may be simply "more Civ". Civ V is a dramatic evolution of the franchise in almost every respect. The Firaxis team knows that every Civ player has their favorite Civ. People still play Civilization and Civilization II. Hell, my favorite Civ is still Civilization III. Firaxis understands this. That's why they have, in fact, set out to reinvent the wheel. If, after you've played Civ V, you still prefer Civ II, or Civ IV, or any of the dozens of expansions or mods or your own, personal boardgame version, then you can go play that. Firaxis knows this and they embrace it. 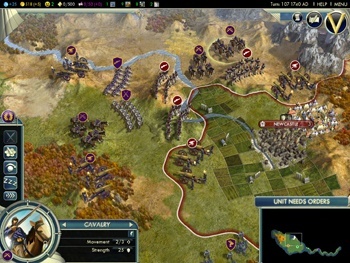 If, however, you're looking for something different and yet still the same, then Civ V is your huckleberry. First of all, they ruined combat, or they made it better, depending on your point of view. If you're like me in that you always thought it was a bit strange that, in the land of Civ, ten troops of spearmen could defeat a single troop of tanks, then again, you're going to enjoy this new Civ.